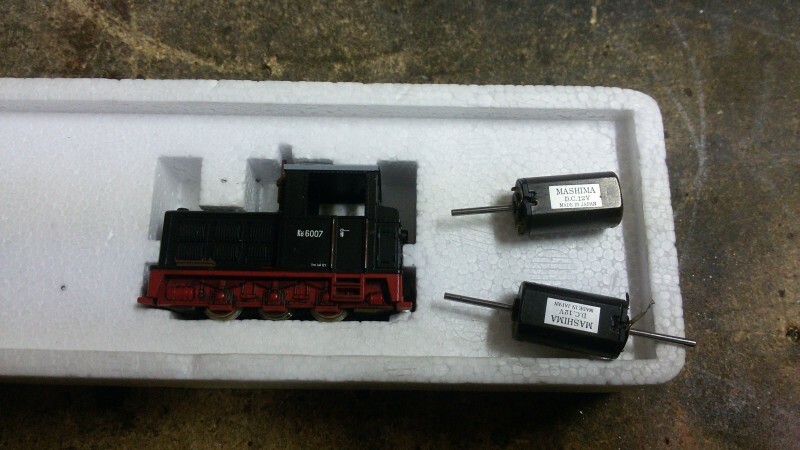 I got a Roco Feldbahn-Diesel of the newer batch from a friend. 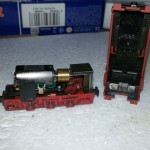 As common, this loco isn’t a good performer in original factory setting. The loco is to light and without any flywheel. So I removed the original motor, installed a Mashima 1020 with small flywheel and a lot of weight. Now she weights 53 grams, and is a good running engine. 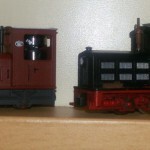 And she really matches nice beside the Roco steam loco I have. With the new locos, I also changed the concept within my loco fleet. The Waldbahn Eusserthal isn’t that big, that more than 2-3 locomotives are really needed. 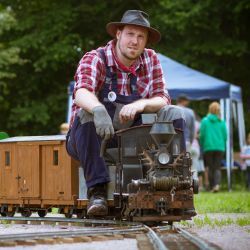 So I go and choose a pair of locos, which are used for a session, representing the full motive power of the logging railroad. 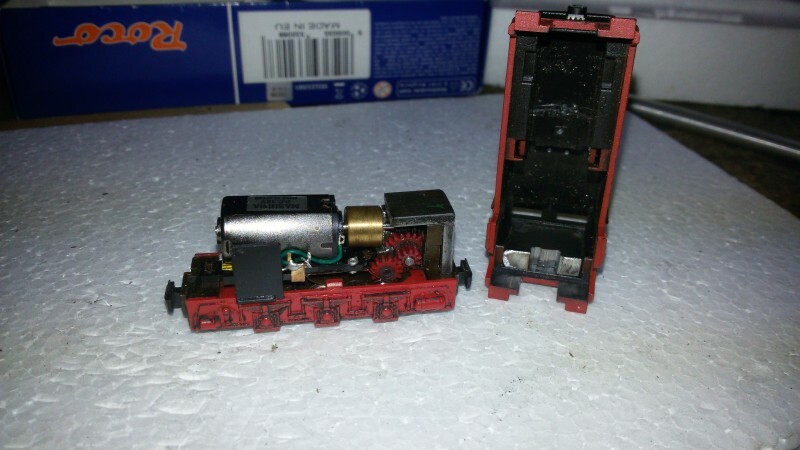 This way, I can combine the Minitrains Krauss and Gmeinder, the Roco locos or the two Brigadelocos. This way it won’t show up, that the grade of detail and at least the scale isn’t the same between those models. How did you connect the 1.5mm Mashima motor drive shaft with the flywheel onto the 1.2mm Roco worm gear shaft? Hope you can help. Hallo Gerd, ich bin erst gegen Abend dazu gekommen, Deinen Blog zu lesen.Feine Sache mit dem “Umbau”. Aber warum nimmst Du zum Ballast nicht Blei, das hat doch mit 11,3 Gramm eine höhere Wichte als Eisen mit 7,72 Gramm? Ich verwende meistens die Luftgewehr-Punktkugeln, die kann man notfalls im Schraubstock plattdrücken, wenn ich mir nicht sogar eine Passform anfertige.Meine Umbauten der Minitrains sind fast fertig, Bilder folgen demnächst.